Doctor Strange’s choice to give up the Time Stone to Thanos near the close of Marvel’s Avengers: Infinity War left many fans responding with confusion and questions as to what the outcome of that decision will be, and what his “only way” to beat the seemingly all-powerful Thanos will amount to, come the release of Avengers 4 in 2019. Today, I want us to think about how Strange’s foreknowledge of the future provides ethical justification for giving up the Stone, an act which led to the death of half of the Marvel Universe (including Strange himself). Earlier in the story, we are treated to a scene in which Strange uses the power of the Time Stone to travel forward in time, viewing over 14 million possible outcomes of the ensuing battle with the Mad Titan. When the other heroes ask him about the likelihood of victory over the villain, the sorcerer responds that the team wins only one of the battles he foresaw. After Thanos delivers a crushing defeat to our heroes, Strange gives up the Stone so that the life of Iron Man/Tony Stark would be spared. When Stark asks him why he gave up the Stone, granting the villain even more power, Strange’s response is ominous, but gives us a clue to his motivations: “We’re in the endgame, now.” This is especially significant, given that Doctor Strange told Stark that he must protect the Time Stone at all cost, even if it meant the death of the other heroes. Later, just before he fades away as a result of Thanos using the power of the Infinity Stones, Strange tells Stark that this course of events is “the only way” to win against their enemy. Strange knows that the heroes, for all their power, are at an extreme disadvantage and must make sacrifices (and other hard choices) just as one might have to do in a challenging game of chess: in order to win, some of your own chess pieces may need to be intentionally or strategically lost. What is most important here, for Strange, is the consequence of his action: his end goal is to defeat Thanos and ultimately to save the universe, rather than allow all of the heroes to die fighting with no chance of victory. If that means the death of half the universe, and (at least temporarily) giving the villain what he wants in order to eventually gain a strategic advantage, this is acceptable. Many people might think there’s something wrong with this line of reasoning on the face of it. After all, the immediate consequence involves countless deaths! The long-term consequences, however, are of such great importance that allowing these immediate sacrifices becomes the right thing to do in Strange’s situation. Perhaps it’s lucky for us (and for the good Doctor) that there’s a school of thought in moral philosophy that defends precisely this kind of moral reasoning: consequentialism. The most well-known variety of consequentialism is utilitarianism, which claims that we ought to choose our actions based upon which choice brings about the highest degree of well-being (or happiness) for the greatest number of people in a given situation. This, of course, assumes that it is possible to rate one’s actions in terms of the amount of pleasure or pain they cause to those involved. This kind of cost-benefit analysis seems simple enough in everyday decision-making, but what about life-and-death scenarios, like the one that the Sorcerer Supreme and his fellow Avengers are faced with? Fortunately, we don’t have to summon the Seven Suns of Cinnibus to enlighten ourselves on possible answers to this, as we have help from moral philosopher Henry Sidgwick, the last of the “classical utilitarians” of the 18th and 19th centuries. Over the course of this post, we’ll examine how Sidgwick’s moral philosophy might be used to support Strange’s actions, and how a certain philosophical view about divine foreknowledge known as Middle Knowledge helps further support the idea that even though Strange’s choice had negative consequences, he remains morally in the right. Sidgwick then notes that some prominent utilitarians (including John Stuart Mill) have attempted to avoid this dilemma by narrowing the scope of our consideration for others, when making moral decisions. This is said to be particularly true when our actions concern only ourselves and those in our immediate circle. Sidgwick flatly denies that we should take this route, appealing to the “complex intertwining of interest and sympathy that connects people in a civilised community” which causes our actions to have consequences that reverberate throughout the community: even negatively affecting those distant from us, in ways that we might not foresee. Shortly thereafter, he notes the scope of utilitarian goals is actually wider than we might think, which produces further difficulty in making decisions. For example, he says that “knowledge, beauty, etc. are generally recognised as unquestionably desirable, and therefore often pursued with no thought of further consequences” (p. 232). For the purposes of our discussion of Doctor Strange’s actions in Infinity War, we might say that strategic victory in conflict should be counted among those things which are unquestionably desirable. With regard to other considerations like these, Sidgwick says that “when the pursuit involves an apparent sacrifice of happiness in other ways, the practical question ‘Should I continue the pursuit or abandon it?’ is always decided by a rough application of the method of pure empirical hedonism” (ibid.). Since Strange’s actions initially benefit the villain and cause obvious harm to the inhabitants of the Marvel Universe, it would seem that this is a clear example of a choice that “involves an apparent sacrifice of happiness” in pursuit of some higher end. Deciding to pursue this higher end of strategic victory at the expense of the happiness of others (by allowing them to die at the hand of the villain) can only be done through some form of rigorous empiricism about the consequences of our actions. This empiricism about what actions bring about greater well-being over suffering is, as Sidgwick has already said, fraught with problems and uncertainties; yet, he says it’s the only way to go about deciding between simple happiness and other important goods. By contrast, he tells us that “in an ideal community of enlightened utilitarians… this swarm of perplexities and paradoxes would vanish, because in such a society no-one can have any reason to think that anyone else will act on moral principles different from his” (ibid.). Sidgwick’s elitism on this score should, I think, give us some pause about the practical effectiveness and applicability of his moral philosophy, especially in dire circumstances. After all, where are these “enlightened utilitarians” in our world? Perhaps they exist only on film or in the pages of comic books. Perhaps the Avengers should be glad that Doctor Strange (using the Time Stone or not) might be one of them. Yet, we know from the story that the sorcerer certainly is enlightened: He knows the precise steps to take in order to stop Thanos! Here, we need to ask what sort of foreknowledge Strange might have, through the use of the Time Stone and how that foreknowledge might function. The narrative, as mentioned earlier, gives us an important clue: Remember that Strange says that he witnessed over 14 million possible future-scenarios involving their battle with the villain, and they only win in one of them. The keyword here is “possible”: There were other options for the heroes that included variables and events which weren’t conducive to their strategic victory, so Strange made choices in alignment with the kind of future that he wanted, even if the actualization of that future required immense loss and suffering in order to be brought about. Just as we found utilitarianism useful in examining his ethical justifications for these sacrifices, we can find a similar resource in philosophical theology to explain how his foreknowledge helps bolster these justifications, in an explanation and appeal to the theory of Middle Knowledge. The Middle Knowledge view of God’s foreknowledge is often referred to as Molinism, after Luis de Molina, a 16th century Jesuit theologian credited with first proposing the theory. It has found prominent modern-day supporters in analytic philosophers of religion including Thomas Flint, William Lane Craig, and Alvin Plantinga, among others. The purpose of the theory is to explain how God’s exhaustive knowledge and providential control over the future could possibly exist together with human free-will, while competing theories of God’s foreknowledge prioritize one over the other (knowledge and control over free will and vice versa). Put more simply, Molinists claim that God not only knows what will happen in a given circumstance (say, that Cheyne will drink coffee after dinner), but He also knows what would have happened if circumstances had been different; for example, “if Cheyne had a soda with his dinner, then he would not drink an after-dinner coffee.” The Molinists think that this statement has a truth-value; that is, it is either true or false, and that God of course knows that truth-value. It’s important for our purposes here to note, as Flint does, that according to this view “both natural knowledge and free knowledge are prevolitional” in that “they are truly independent of any exercise of God’s free will” (pp. 5; 4). From this, we are told that these truths “can be thought of as present to God when he is deciding what creative act to perform.” In other words, God “sees” every possible scenario and every action that free creatures would perform in each scenario. Putting all that’s been said here about the Molinist position together, Flint offers this quick summary: “once [God] decides which creatures to create and in which situations to place them, he foreknows exactly what those creatures will do” (p. 5). With all this in mind, let’s return to the Master of the Mystic Arts and his plan to stop the Mad Titan, Thanos. If we consider the scope of Strange’s foreknowledge of future events, especially the fact that he claims to have seen over 14 million possible sets of circumstances with victory over the villain occurring in only one of these scenarios, it looks like Strange (through the use of the Time Stone) possesses a form of Middle Knowledge: His fellow heroes make their own choices, and he simply knows which scenarios bring about those choices, and what the outcomes are. All the Sorcerer Supreme has to do is set the desired scenarios in motion to achieve ultimate victory. 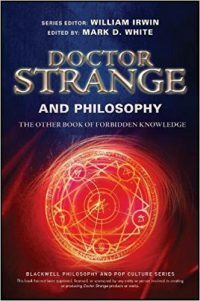 Thinking about Doctor Strange’s foreknowledge through a Molinist lens helps us to understand a great many of his actions (and the actions of some other characters) after his vision takes place, especially if we think of Strange’s choosing which scenario to set in motion from a utilitarian framework. We can connect this to our earlier description of Sidgwick’s utilitarianism by noting that strategic victory against the villain is the desired goal, but when all the variables and possible combinations are considered, only one set of them leads in that direction. Applying Sidgwick’s “empirical hedonism” is not difficult for the Sorcerer Supreme here. Victory against Thanos is an overwhelmingly positive outcome, regardless of the immediate consequences leading up to it, given that total defeat would likely land the Marvel Universe under his permanent tyrannical rule. So, with the help of the theories of Middle Knowledge and utilitarianism, it appears that Strange can justify his course of action, even though it led to the deaths of countless innocent people, including many of his fellow Avengers. It’s fairly clear from the dialogue and events that transpire after his look into the future that Strange’s giving the Time Stone to Thanos is part of the great mystic’s plan to eventually win the day. After all, he does explain to Stark that this action is part of the “end-game” where necessary sacrifices must be made: Strange witnessed no scenario where the heroes were victorious and kept possession of the Stone. This might be a poor decision in the short-term, but our hero knows the outcome that will be brought about, so the kind of utilitarian justification that we discussed at the outset holds even stronger than before. Thinking about it this way also explains how he can vow to protect the Stone at the outset of the film yet give it up so quickly later on. It’s safe to assume that he made such a vow on the basis of what limited knowledge he had at the time, but after acquiring much better knowledge, his decision-making calculus changed. This may even explain the good Doctor’s defeat at the hands of Thanos, ending their brief one-on-one bought: Within the 14 million scenarios that he saw, it is likely that there are ones where he fought harder to defeat Thanos, and ones where he underestimated his opponent’s power. Perhaps he saw a way to combat the villain that was just right, requiring defeat in battle to proceed down the path to victory in the war. Let’s consider the actions of one of the other heroes in light of what we’ve said about Doctor Strange’s foreknowledge of circumstances and how they affect free actions and their outcomes. One of the Avengers’ early attempts to stop their foe involved a plan to wrestle the Infinity Gauntlet from him, effectively robbing him of most of his power. This was unsuccessful, primarily due to an outburst by Peter Quill after learning of the murder of his friend and lover Gamora at the hands of Thanos. This initial plan (and Quill’s subsequent outburst) happens almost immediately after Strange’s vision. If what we’ve said so far is correct—that Doctor Strange’s foreknowledge is in fact a kind of Middle Knowledge, as his talk of “possibilities” suggests—then we can reasonably say that everything that transpires after the vision is indeed a part of Strange’s plan. We can use the same reasoning as above to consider that Quill’s outburst was not an unknown variable to Strange, but rather a move that the sorcerer knew Quill would make in this situation, and allowing it to occur was helpful overall to their cause (even if it looked like a foolish mistake on Quill’s part, in the short-term). Strange wants to win, so he sets that set of circumstances in motion, bearing in mind that others will freely choose disadvantageous actions within this one scenario that leads to victory. Since it is the only scenario that leads to the heroes winning, it can be argued on utilitarian terms that Quill did nothing wrong in his outburst against the villain and in fact did not stop them from winning. On the contrary, his action, just like Doctor Strange’s, seems necessary to their victory, given what we’ve said about the nature of Strange’s knowledge of the future. Following this line of reasoning, perhaps the deaths of various heroes are needed as well: Let’s not forget that after Peter Parker fades away in the arms of Tony Stark, Strange claims that such an end is “the only way” to win. The Sorcerer Supreme is a fascinating character, and like all great characters, he is not without his faults or shortcomings. Yet, as I hope to have argued here, his actions in Avengers: Infinity War shouldn’t be counted among them.